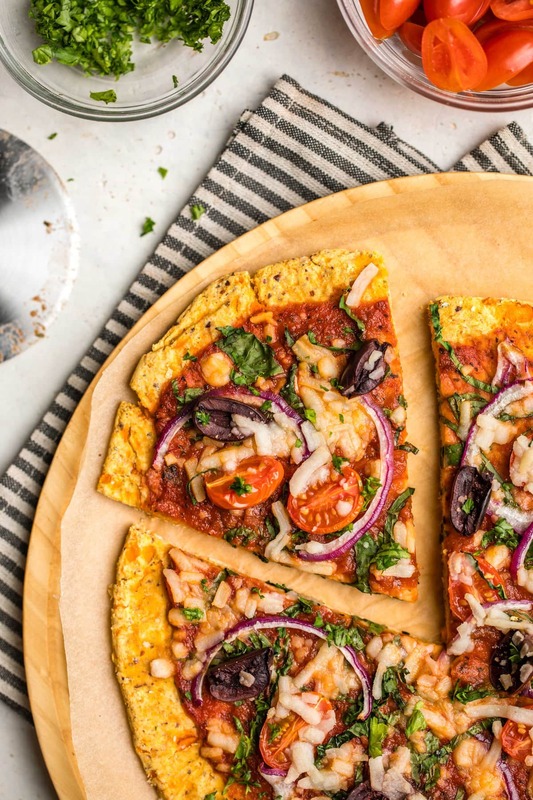 Finally, Sweet Potato Pizza crust that’s fluffy, healthy, and delicious! 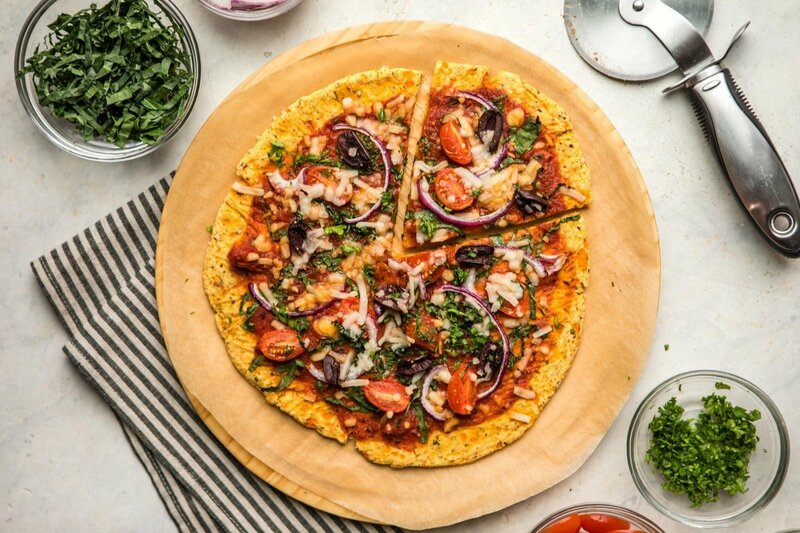 Vegan, Gluten-Free, and made with only 5 ingredients. I LOVE Pizza! 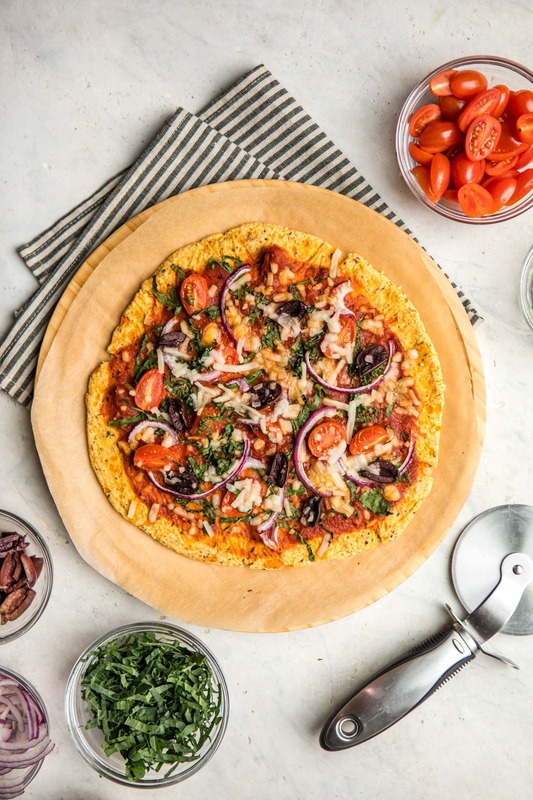 However, the search for a healthy AND tasty homemade Pizza Crust that’s also Vegan and Gluten-Free has been a little…difficult, to say the least. The hunt is over, friends! 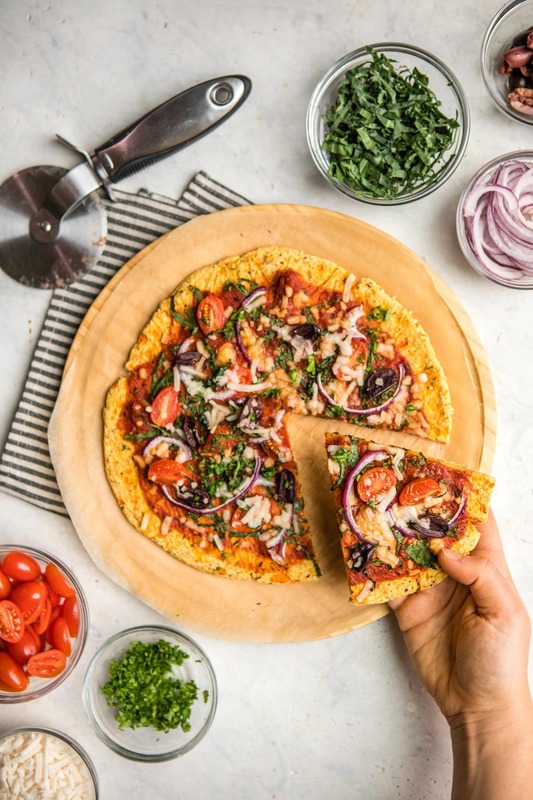 After some testing in the kitchen, I’ve created this 5 Ingredient Sweet Potato Pizza Crust that actually holds together and ticks all of those boxes. Shall we? 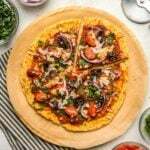 We’ll use a combination of Brown Rice Flour, Tapioca Flour, and Baking Powder to help or Sweet Potato Pizza Crust get that right balance between doughy and fluffy. I also like to add in extra seasonings to my dry ingredients to really amp up the flavor! My favorite spices to add are Garlic Powder, Italian Seasoning, Black Pepper, and Smoked Paprika – but you can really add whatever you’d like. 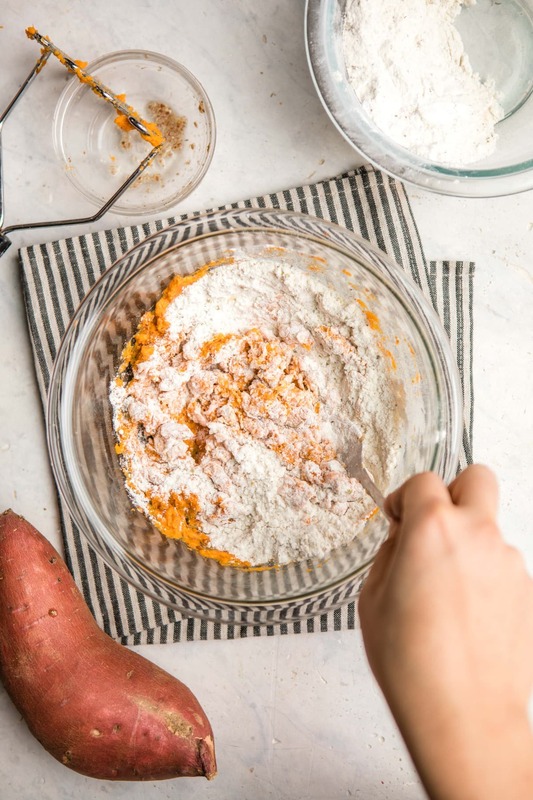 Once you whisk the dry ingredients together, add half of them to the Sweet Potatoes and mix with a fork. Then, add the remainder of the dry ingredients and use your hand to knead everything together. The dough should be pretty moist, but should not stick to your clean hand once finished. Once you finish decking out your Pizza, return it to the oven for an additional 10-12 minutes, then serve and enjoy! 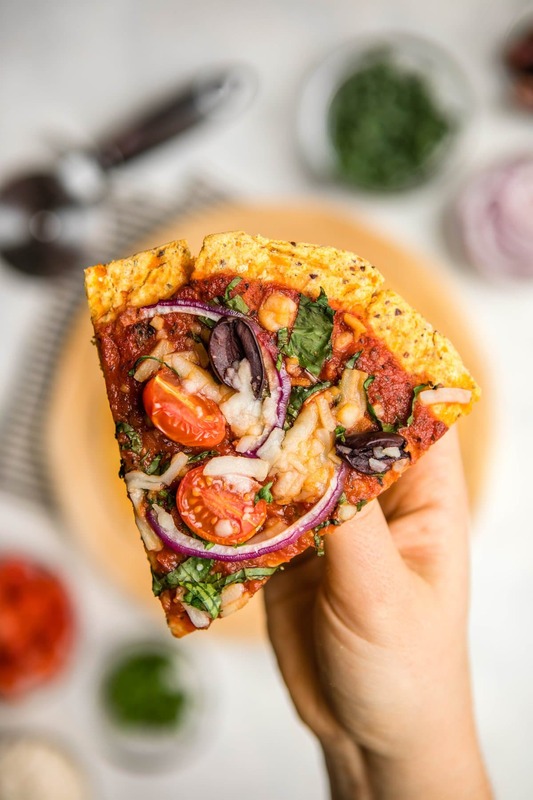 You can use this Sweet Potato Pizza Crust for a traditional Pizza like I did in these photos, but don’t be scared to get creative! The Sweet Potato flavor is present in the crust, but I don’t find it to be too overpowering. I love to experiment with different toppings, and even make Sweet Potato Dessert Pizzas when I’m feeling extra fancy. This recipe can easily be doubled or tripled, so don’t be afraid to make a large batch and have a Pizza Party! This pizza dough can be made in advance! 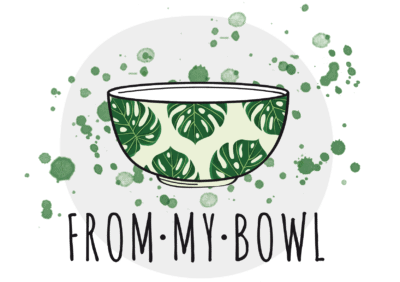 Place it in a firmly sealed container, and it’ll keep in the fridge for up to 3 days before use. If you’d like a smoother pizza crust, be sure to steam your Sweet Potatoes very well, but if you’d like some Sweet Potato pieces in the crust, you can steam them until only slightly soft. I liked both variations, and think it comes down to personal preference. I have not tested this recipe with any other flour combinations and cannot recommend substitutions. If you try something else and it works for you, please let me know in the comments below! 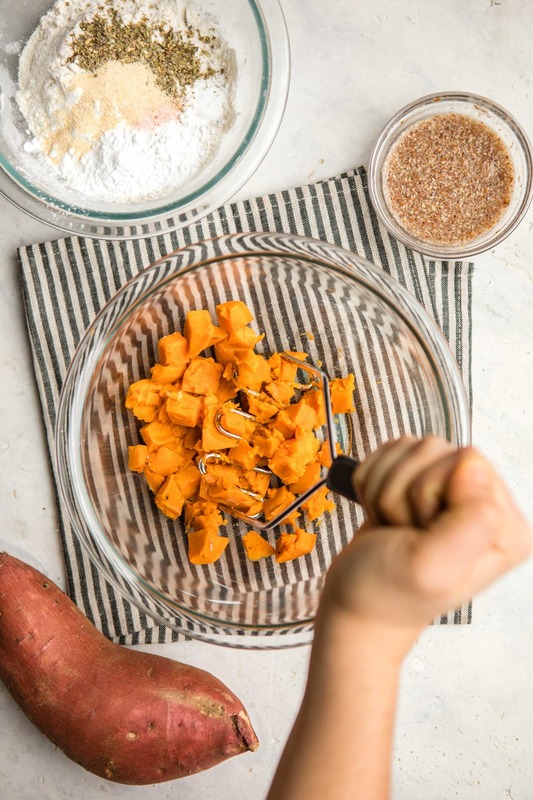 Looking for more yummy recipes using Sweet Potatoes? Go savory with a Sweet Potato & Rosemary Vegan Quiche and this Chipotle & Sweet Potato Soup, or maybe take the sweet route with these Sweet Potato Breakfast Bowls and Sweet Potato Pie Bars! Preheat the oven to 375 F. Peel, dice (to about ½” pieces), and measure out your Sweet Potato. I recommend using a food scale for best results. Fill a steamer basket with a small layer of water, then steam the Sweet Potatoes until fork tender, about 10-15 minutes. While the Sweet Potatoes are steaming, prepare the Flax “Egg” in a small bowl and set aside. Combine the remaining dry ingredients in a medium bowl and whisk well. Transfer the Sweet Potatoes to a large bowl, then mash well. Add the Flax Egg and mix until evenly combined, then add in half of the dry ingredients and mix with a fork. Add the remainder of the dry ingredients – at some point you will need to switch to using your hands to knead the dough into a ball. Next, place the dough ball between two sheets of parchment paper. 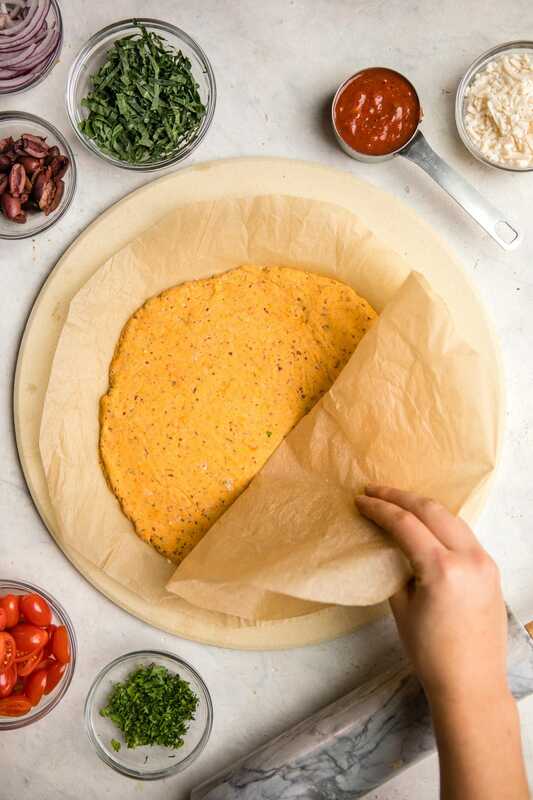 Use a rolling pin to flatten the dough into a circle about ⅓-½” thick, then peel back the top layer of parchment paper. Transfer the dough + bottom layer of parchment paper to a baking sheet, then bake for 10 minutes. Remove from the oven, and cover the crust with the second piece of parchment paper. Flip the crust over so that layer is now on the bottom, then peel back the base layer of parchment paper, which should now be on top. Top the Sweet Potato Pizza Crust as desired, then return to the oven for an additional 10-12 minutes. You can broil the pizza at the end for an additional 1-2 minutes if you’d like your toppings to be extra crispy! Leftovers will keep in the fridge for up to one week. I highly suggest using a food scale to measure out your Sweet Potato. Otherwise, the consistency of the crust will not be the same. I have not tested any other flour combinations for this recipe and cannot recommend substitutions for the Brown Rice Flour. Tapioca Starch/Flour may be substituted for Arrowroot Powder. Looks so so good ! Can’t wait to give it a try ! Yes, I believe that it would! What were all the toppings you added here? Btw: Looks amazing! Ate it half an hour ago with my non-vegan mom! It was really delicious! I didn’t have brown rice flour so I tried it with normal flour (half spelt flour, half wheat flour) and I doubled the amount. It was not really fluffy but it was definetly good and I will try it again with other combinations of flour! 😀 Maybe I will get some brown rice flour some day… 🙂 I topped mine with chunky tomato sauce, corn, red bell pepper and arugula. Thanks for the yummy lunch Caitlin! It certainly looks delicious. Any idea what ths carb count is for this? I would recommend boiling the sweet potato in water over microwaving. The microwave will dry it out too much! Btw: What toppings did you add? I’d love to recreate it! Sorry! didn’t rate your recipe. I will make it again👍✨ Thank you for sharing your creation. Has anyone tried using a grain free flour? It looks amazing! I’ll have to give it a try substituting some other flour. Thank you for the idea! 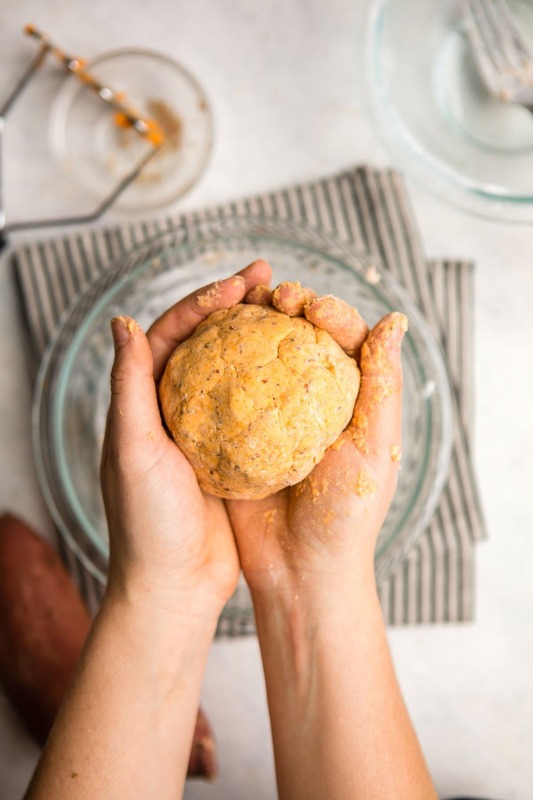 Almond Flour would most likely work – let me know if you try it out!